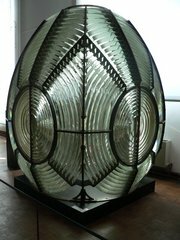 A Fresnel lens is a type of lens invented by Augustin-Jean Fresnel. Originally developed for lighthouses, the design enables the construction of lenses of large size and short focal length without the weight and volume of material which would be required in a lens of conventional design. 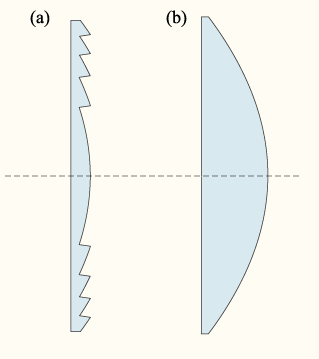 The Fresnel lens (often pronounced FREZ-nell but usually the original fre-NELL in theatrical and motion picture lighting applications) reduces the amount of material required compared to a conventional spherical lens by breaking the lens into a set of concentric annular sections known as Fresnel zones. For each of these zones, the overall thickness of the lens is decreased, effectively chopping the continuous surface of a standard lens into a set of surfaces of the same curvature, with discontinuities between them. This allows a substantial reduction in thickness (and thus weight and volume of material) of the lens, at the expense of reducing the imaging quality of the lens. For the reasons given above, Fresnel lenses tend to be used in applications where weight of the lens is at a premium and/or image quality is unimportant. 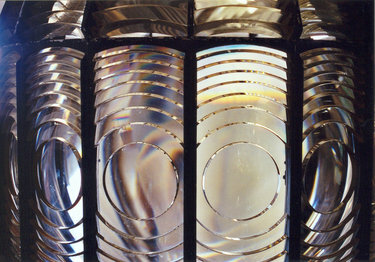 High-quality glass Fresnel lenses are used in lighthouses and may include extra annular prismatic elements to improve the brightness of the light beam. Glass fresnel lenses also are used in lighting instruments for theater and motion pictures; such instruments are often called simply fresnels. The entire instrument consists of a metal housing, reflector, lamp assembly, and fresnel lens. A slot on the housing can hold a colored film (gel) to tint the light. Many fresnel instruments allow the lamp to be moved relative to the lens focal point, which creates a more or less hard-edged light beam. Cheap Fresnel lenses can be stamped or moulded out of transparent plastic and are used in overhead projectors, projection televisions, and hand-held sheet magnifying glasses. A related optical device is the Fresnel zone plate. Fresnel lenses are also used in solar forges. 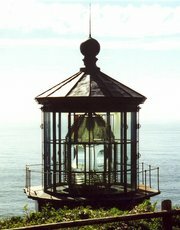 Fresnel lenses for lighthouses are classified in six orders based on the focal length of the lens. The largest (first order) lens stands 12 feet (3.7m) tall and 6 feet (1.8m) across, with a focal length of 36 inches (0.91m). The smallest (sixth order) stands only 2 feet (0.60m) tall, with a focal length of 5.9 inches (14.9cm). 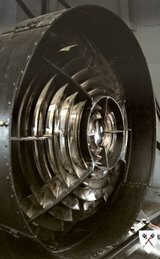 A 7th "hyperradial" lens was also made. It was larger than the 1st order.